Joy Kim | Librarian. Book Reviewer. Coffee Addict. Librarian. Book Reviewer. Coffee Addict. For the last three years, I’ve attended Sirens, an interdisciplinary conference dedicated to women in fantasy literature. In 2015, the conference will be held in Denver, from October 8-11, with the theme of “rebels and revolutionaries.” If you know me and what I like to read, you will understand why I am really excited about this year’s theme. Every year the conference organizers develop a reading list for staff, and this year, they’ve adapted that reading list into a reading challenge. I do love a good reading challenge! It’s been a little over two years since I accepted my first job with formal supervisory responsibilities. These days I supervise 12 direct reports and manage a building with 25 staff. So it’s fair to say that I have a lot of thoughts on the importance of good management and leadership. As many of my friends and peers have gone through the same transition, I’ve often found myself recommending the following books and articles. I read a couple of them when I was still pursuing that first promotion, so I have to thank the mentors who recommended them to me. I’ve also reread most of them, either in whole or in part, and found them still informative the second (or third) time around. I’m presenting this list with minimal commentary, because if I try to write annotations, it will likely never get posted. Managing to Change the World: The Nonprofit Leader’s Guide to Getting Results by Alison Green and Jerry Hauser. Crucial Conversations: Tools for Talking When Stakes Are High by Kerry Patterson et al. As a bonus, here are a couple other books on business and productivity that I’ve found useful or thought-provoking. Get Things Done: The Art of Stress-Free Productivity by David Allen – because if you can’t manage yourself, how can you manage others? I don’t implement a complete GTD system, but what I do really helps me manage my workload. What I’m reading now: Start with Why: How Great Leaders Inspire Everyone to Take Action by Simon Sinek. It comes highly recommended. Maybe it will end up on my rec list in the future! And yep, none of these books are library-specific. I do enjoy reading blog posts and articles on library leadership and management, and I know at least one person doing really interesting research on it. But I also think it’s important for library leaders to be willing to look outside our industry for best practices and research. Over the weekend, I attended Sirens, a conference on women in fantasy literature in Stevenson, Washington. This is the second year I attended, but I’m sure I will be back again in the future (especially if it continues to be held in the PNW). It was a great opportunity to catch up with old friends, meet new ones, and listen to smart people talk about literature and ideas. If I met you there, hi! Like all of the attendees, I came away with a long list of books to read or re-read. I probably also contributed to a lot of other people’s to-read lists . . . I am, after all, a librarian, and there are few things I enjoy more than matching readers with books. Here are a few that I found myself mentioning or thinking about a lot this weekend, for a variety of reasons. Rosemary Kirstein’s Steerswoman series, which has rich and varied roles for its women characters and one of my favorite female friendships in sf/f. I wish I could talk more about one of the other reasons I love it without spoiling the first novel. Start with The Steerswoman’s Road, which is an omnibus that collects the first two books. Warning: the author writes slowly, and there are two more books planned in the series, so you may be in for a bit of wait after reason book 4. It is still totally worth starting. Sherwood Smith’s Inda series and the related, brilliant, and totally readable as standalone, Banner of the Damned. I enjoyed the Inda books quite a bit, but I bounced Inda the first time I tried to read it. I am pretty sure that I would not have had that problem with Banner. The Demon Catchers of Milan by Kat Beyer, a sadly underappreciated YA novel from 2012, about a girl who discovers she is descended from a long line of exorcists after she herself is possessed. The descriptions of food will make you want to plan an eating tour through Italy. Ooku by Fumi Yoshinaga, which I somehow forgot to mention at my roundtable on women political leaders in fantasy until someone asked me for manga recs after we wrapped up. The Finder series by Carla Speed McNeil. Which is sf, rather than fantasy, but still totally something that I think most Sirens attendees would enjoy reading. The Lymond Chronicles by Dorothy Dunnett. It’s a six-volume epic historical fiction series which has been hugely influential on sf/f and romance writers, and if you’re about my age and have been involved in sf/f fandom for a while, you are probably aware of it even if you haven’t read it. However, I was reminded that it’s actually not terribly well known to younger readers. During Sirens, Ellen Kushner had a great one-sentence description of the protagonist that I failed to write down, but it was something like, “He’s a neurotic, polymath, omnisexual, impossibly beautiful, and tortured hero.” I am probably missing some adjectives, but even without them, this is a very accurate description of Lymond. Give the first book 150 pages or so before you say yay or nay…many readers who go on to enjoy the series find the beginning rather confusing. It’s a a sad state of affairs when you have a begin a very positive review for a trade collection with the warning, “By the way, this comic was cancelled!” It gets even sadder when you have to add, “Not only was this comic cancelled, the whole DCU was rebooted and they’re pretty much pretending this never happened!” And when you really ought to add a third and final disclaimer–“It really helps to have read Batgirl: Batgirl Rising and Batgirl: The Flood, even though they aren’t as good as this collection, and also to know something about Stephanie Brown’s rather complicated character history”–it’s hard not to wonder whether reviewing the book in question is something of an exercise in futility. Welcome to my review of Batgirl: The Lesson, folks. Many disclaimers apply. Batwoman–the long-awaited follow-up to the Batwoman Elegy arc by Greg Rucka and J. H. Williams III that ran in Detective Comics a couple years back–is the least surprising good thing to come out of the DC New 52. 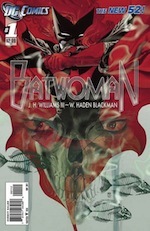 Written by J. H. Williams and W. Haden Blackman, and drawn by Williams, Batwoman was always supposed to be a pretty good comic book. The only surprise, I suppose, is how long it took for it to finally come out . . . and how very good it’s managed to be even without Greg Rucka anywhere in the credits. The story here picks up soon after the events of Elegy. Kate Kane, our hero, is still dealing (or rather, not dealing) with the emotional fallout of the events of Elegy, which are conveniently recapped in Issue #1 in case you missed it. She has a new crime fighting partner, her cousin Bette Kate (aka Flamebird), and a new girlfriend, Detective Maggie Sawyer of the GCPD. Maggie and Batwoman are both investigating a series of abductions of children by a mysterious figure known as The Weeping Woman. 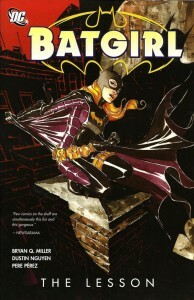 And Batwoman, in turn, is being investigated by Agent Cameron Chase of the Department of Extranormal Operations, who is charged with uncovering Batwoman’s true identity. 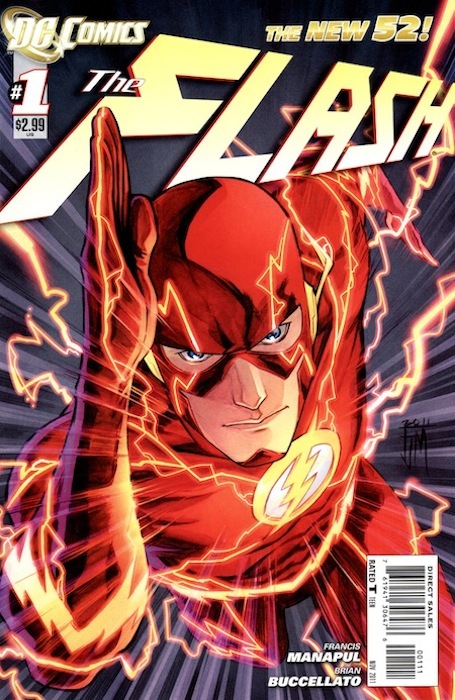 If you’d told me a year ago that one of my favorite monthly comics be DC’s relaunched The Flash, I would have laughed in your face. Superhero comics are not my favorite type of sequential art, nor do I have any childhood nostalgia for the title draw upon. The closest thing I have to childhood nostalgia for superhero comics is my fondness for the Batman animated series; I didn’t start reading sequential art until I was in my twenties. 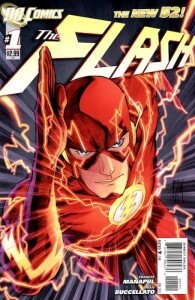 And The Flash wasn’t a comic that had any obvious appeal to me. What I’d seen of it seemed stuck in the Silver Age–a bit square, and very dated. 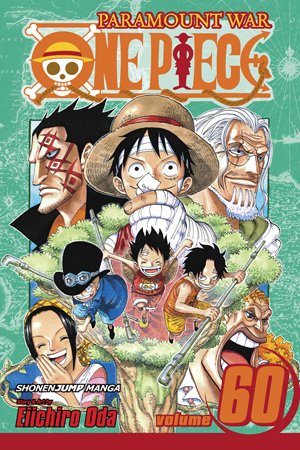 Next on my catch up list: One Piece by Eiichiro Oda. 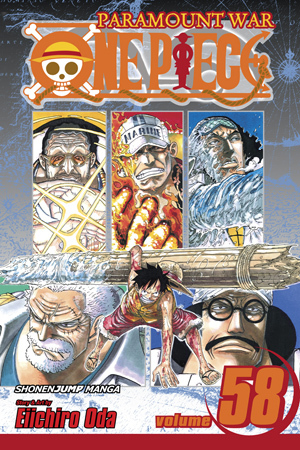 Volumes 56 through 60 of the series follow Luffy on his desperate quest to save his brother, Ace, from execution by the Marines. 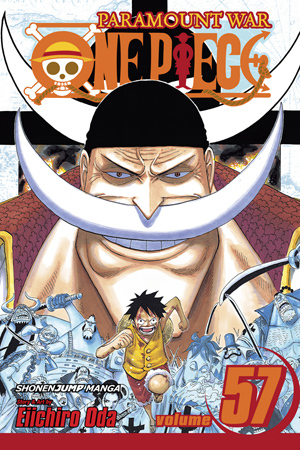 Some One Piece arcs don’t necessarily do much to move the larger series arc forward, but that’s absolutely not true of the Impel Down/Paramount War arc. There is so much weight of story behind the events here that it’s hard to escape the sense that everything’s been building up to these moments. This might not be anywhere close to the end of the series, but it’s definitely a huge turning point. Today I looked at the Diamond comics sales figures for January and found myself pondering the reasons why comics like Justice League so consistently leave me cold. 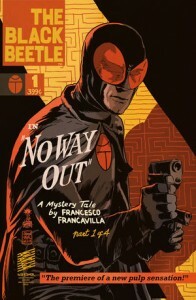 It’s a bestselling series: clearly this is a story that works for a lot of direct market comics readers. But it doesn’t work for me now, and it hasn’t worked for me in the past. 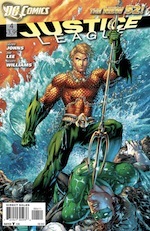 I flipped through Justice League #4 when it arrived at my library, and was amazed at how uninterested I was! You would think, given that I currently read both Batman and The Flash, that I would find it at least somewhat appealing. Instead, I was just mildly bored. I know updates have been few and far between lately, but that’s because a lot has been going on in my offline life that’s demanded my attention. Last week I accepted a new job as Youth Services Librarian for Pierce County Library System (WA), starting in mid-July. I will miss my colleagues and community at San José Public Library a lot, but I think that this new opportunity will be a good fit for me. I’m very excited and very happy. In the short term, I’m also very busy. Once I finish up at SJPL, I’ll be apartment hunting, attending the ALA Annual in DC, and then moving. So regular updates aren’t likely to resume here until summer is winding down. 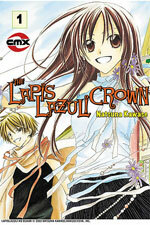 I have been reading a lot of graphic novels and manga lately, though I have not had time to review them properly. Here are three that I’ve I’ve especially enjoyed. 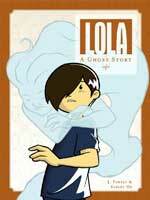 Lola: A Ghost Story by J. Torres and E. Orr is the story of a Filipino-Canadian boy who has inherited his grandmother’s ability to see ghosts; its depiction of family as both wonderful and uncomfortable feels just right. Smile by Raina Telgemeier is a memoir about the ups and downs of growing up, framed by the story of the creator’s dental trauma. I think it will resonate with all of us who have experienced the joys of orthodontia. Finally, Twin Spica 1 by Kou Yaginuma is a science fiction manga about a girl who wants to be a girl who wants to be an astronaut. I had high hopes for this one, and I wasn’t a bit disappointed. I can’t wait to get my hands on volume two! 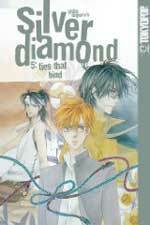 This week marked the return of Shiho Sugiura’s Silver Diamond to Tokyopop’s publication schedule, and that is a reason for much rejoicing. It has been almost a full year since US readers got a new volume of this underappreciated shōjo gem, which combines an interesting fantasy premise with warm, funny character moments. 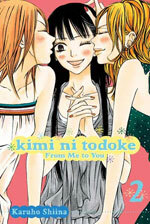 I wrote a review of volume 3 for Manga Life a while back; pretty much everything I said there applies to this volume as well, so I will skip writing up a full review. My apologies for this week’s unexpected downtime! I was singularly unimpressed by my previous host’s handling of the downtime, and I’ve switched over to a new host…and while I was at it, a new WordPress theme. Please excuse any electronic dust while I get the site up and running again–and let me know if you see anything drastically wrong. This month I’ve read volumes from two different series by Hidaka Banri–I Hate You More than Anyone (vols. 1 and 2) and V. B. Rose (vol. 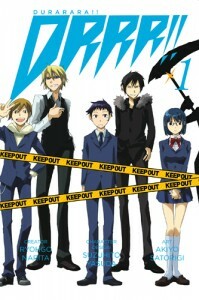 1 only)¹–mostly thanks to the recs of various folks in the manga blogging ‘verse. Hidaka’s work had been on my to-read list for a while anyway, but last month’s discussion of female friendship in shōjo manga inspired me to track them down sooner rather than later. 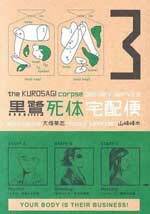 It’s worth noting that Hidaka is a very prolific creator of shōjo manga. Her author notes in V. B. 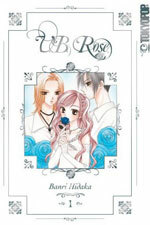 Rose 1 indicate that it is her twenty-seventh published series! I gather that some of those series are quite short, but that’s still a lot of stories. I Hate You More than Anyone and V. B. 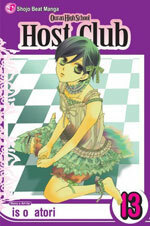 Rose began serialization seven years apart; the former begin in 1997, the latter in 2004. Reading volumes from both series within a relatively short timeframe has provided an interesting look at Hidaka’s work at two different stages of her career. This weekend I spent much of my time reading many, many volumes of Claymore by Yagi Norihiro, after repeated recommendations from people whose taste I trust persuaded me to give the series another try. 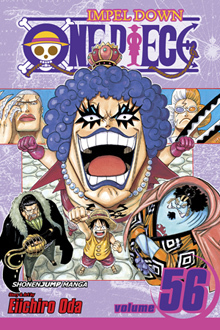 Those of you who have been reading this blog since way back when will remember that I was a bit underwhelmed by volume 1. I actually didn’t think volume 1 was much better the second time around, and volume 2 wasn’t very good either. However, starting with the origin story in volume 3, the series gets increasingly awesome. It’s such a pleasure to see familiar shōnen tropes like “I will protect my precious person!” and “I will learn new techniques and get stronger!” used in a story where the vast majority of the cast are women. 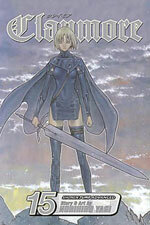 Nevertheless, though Claymore‘s women characters get a much better deal than they would in most other shōnen series, the series’s treatment of gender remains flawed. Yagi gives his readers truly compelling women characters–smart, strong, independent, driven–that subvert a lot of the shōnen genre expectations for the women characters to be token, disposable, or both. But who is he really writing for? Or more specifically, who is he drawing for? Fifteen volumes in, I’m ridiculously fond of Claymore‘s women warriors, but I still have a sneaking suspicion that Yagi’s target audience does not necessarily include me. A few days ago I finally sat down with volume 13 of Ouran High School Host Club, which I’ve been saving up as a special treat. Ouran is a comfort read for me. It’s always funny, often sly, and occasionally moving, and I find it to be a reliable pick-me-up after a long day. Since I’ve reviewed the last four volumes more formally (review of vols. 9-10 and review of vols. 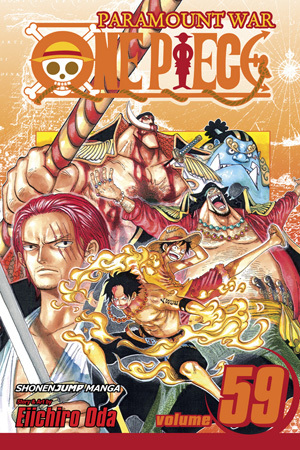 11-12), I thought I’d take a break and discuss volume 13 a bit more casually. After all, one of the downsides of reviewing is the pressure to avoid major spoilers. I’m all for not ruining the story for other people, but skimming over details tends to stifle other kinds of analysis. So having some non-review posts that provide separate spaces to discuss works are nice as well. Over on Twitter today, Sean Gaffney (@Toukochan) of A Case Suitable for Treatment observed that many shōjo series have the situation “heroine hated by all female classmates, has male friends.” In response, I remarked that I have limited patience for shōjo manga that do not value female friendship. David Welsh (@PreCur) of The Manga Curmudgeon asked us to share our favorite series that do respect and celebrate female friendship. And so we did. Like many people in the kingdom of Savarin, Miel has been born with magical power. Unfortunately, she has not been able to master her ability. Her sister, Sara, is the overachieving genius of the family, and Miel has decided to live a normal life without magic. But when she makes a new friend, Radi–they meet after she accidentally flings her purse at his head–she decides that learning to harness her magic might be worthwhile after all. Of course, with Miel’s ridiculous super strength, that’s going to be easier said than done! Joy has read 1 book toward her goal of 120 books.